INEXPLICATA has written elsewhere about the "simiots" of Spain's Catalunya and Upper Aragon - creatures that may well find their U.S. counterparts in our very own Bigfoot. 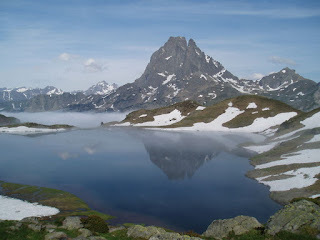 "There exist cratures of considerable height, completely covered in hair, that wander the Pyrenees with incredible agillity, and even along non-Pyrenaic ares such as Zenauri, in the Basque Country, or the caves of Muskia and Mailuxe. They are collectively known as the "Basajun", the lords of the forests. 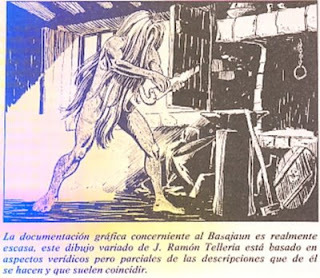 "According to journalist Roberto Artetxaga, the existence of this folkloric creature is deeply rooted in Basque tradition, and adds that its very name is suggestive, as the Euskera words "baso" (forest, wilderness) and "Jaun" (lord) render the composite of Basajaun, master of the forests or the wilderness. "The description is that of a creature endowed with extraordinary physical force, great agility and speed of travel, consierable height, quite taller than an average man, and fully anthropopmorhic features, covered in long hair and sometimes described as having long claws. "Many people believed that these creatures posessed the secret of cultivating wheat and that humans learned from them how to plant and harvest it. They are also considered as the first ironsmiths and millwrights, from whom humans learned the secret of the saw, the millwheel and the welding of metals. Basajaun is considered as the protective spirit of flocks, and up to only a few years ago, Basque shepherds held the belief that when animals caused their bells to ring at the same time, it meant that the Basajaun was near. Shepherds found this reassuring, safe in the knowledge that their herds would not be decimated by wolves. "Legend and reality have become interwoven, but J.M. Satrústegui points out in his book "Mitos y Creencias" that livestock farmers in Valcarlos and Ondorrola were fully convinced of this creature's existence. He even managed to secure the testimony of an elder who told him that he would receive visits from the basajauns at his homestead, but never knew why. They had not visited him for a long time. Another eyewitness account mentions a sighting of a young Basajaun basking in the sun at the opening to the Mailuxe cave, and the added description of this creature as being blond.